After watching him come back from an early pounding to choke out Shane Carwin with an arm-triangle, I'm ready to officially anoint Brock Lesnar the title of "White Shaq of MMA". In my Mayweather-Mosley post-fight piece "All he saw were shadows", I likened Floyd Mayweather, Jr.'s splendid display of speed, timing and technique to a demonstration of the special Shaolin shadowboxing technique. In this Vazquez-Marquez IV pre-fight piece, I explore the modern Mexican version of Shaolin shadowboxing in the context of Shaolin kung fu's rivalry with the Wu Tang sword style. The martial arts referred to in this piece are the Shaolin and Wu Tang methods cinematically depicted in the cult favorite Shaolin and Wu Tang (aka Shaolin Master Killer). "Thank God no swords were involved." * Credit for photos used in this piece courtesy go to the UFC. 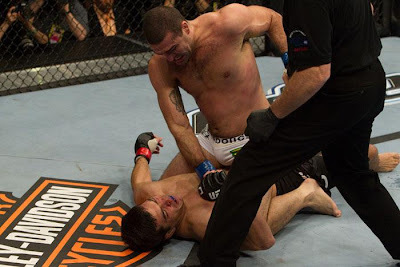 I wasn't surprised to see Lyoto Machida get cracked over his left temple and drop instantly, bear-hugging Mauricio "Shogun" Rua's waist and holding on for his dear life. Machida would get no mercy from the Shogun, who pounded The Dragon until his lights turned out 3:28 into the very first round of their rematch. Machida had been clipped hard just a minute and 18 seconds ago. After separating from the clinch, Shogun charged at Machida in full force, throwing punch after punch. Two of them, a left and a right, connected. The left simply caught Machida by surprise, but the right that came three punches later wobbled him. When I watched Machida-Shogun (UFC 104), I was scared for Lyoto Machida, my favorite MMA fighter. I had never seen him get hit so much. He was getting tagged with body kicks, leg kicks and punches and elbows to the head. I all but expected to see him lose in a unanimous decision when the final bell sounded. However, after reviewing footage from the fight (see for yourself), I don't think Mauricio "Shogun" Rua was "robbed," as many - including Shogun himself - may feel. I still have no idea what happened to Shane Mosley on Saturday night. You could say that he was schooled by Floyd Mayweather, Jr., smacked upside the head by a brand of pugilism from another realm. You could even say that it was Mayweather's special technique of shadowboxin', so fast and so sneaky that Mosley didn't know what hit him. You could say that it was his age, that at age 38 with numerous wars behind him, he could no longer hang physically with a younger, faster, more skilled man. You could even say that he gave himself away prematurely by firing his best shots in the second round against Mayweather, that it was over once Pretty Boy Floyd survived and figured out how to stay suave. However, even as someone who expected Mosley to be beaten decisively, I have a tough time comprehending why he lost this badly, as a broken man.